Whilst in Tanoumah in June I met Ahmed AlKassim an excellent local bird photographer. He was staying there for a number of days and managed to see and photograph an Arabian Spotted Eagle-owl after I left. 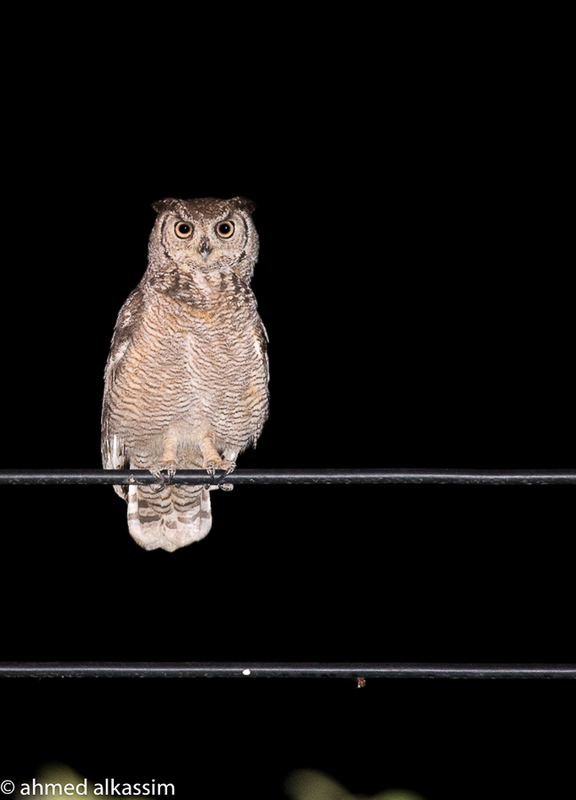 Ahmed has very kindly sent me one of his amazing photos of the Arabian Spotted Eagle-owl taken on some overhead wires in the Tanoumah area and has allowed me to use it on my website which is shown below. Please note the copyright of this photos belong to Ahmen AlKassim and should not be reused without his permission. The subspecies in Arabia is an endemic sub-species to southwestern Arabia and although not rare is difficult to locate. Birds are resident near the Red Sea coast north to Jeddah and can be seen in the Tihamah and Asir areas including Najran and Hejaz north to Taif. Other birds have been seen in a wooded wadi eight kilometres east of Wadi Juwwah in April near Tanumah at various times of year. The taxonomic status of form milesi, significantly isolated in southwest Saudi Arabia, Yemen and Oman, is uncertain. It is more tawny in colour and smaller than nominate and tanae both from Africa, and its vocalizations differ (though fuller details required) and is possibly specifically distinct. The species African Spotted Eagle-owl is a rather small eagle-owl with long, erect ear-tufts and with race milesi smaller and more tawny coloured. They use a variety of habitats, from rocky outcrops in desert to woodland with sparse ground cover: particularly favours areas with mosaic of low hills, grassland and scrub; prefers semi-open woodland, and rocky hills with scattered trees and bushes; also found in thorn savanna; avoids dense forest. From sea-level up to c. 2100 m.